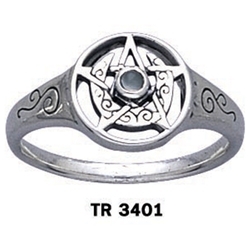 Our Crescent Moon Pentacle Ring with Stone shows the crescent or horned moon entwined with the pentacle. The pentacle is a symbol of Earth, Prosperity and Protection. The pentacle in its upright position represents the Spirit in balance and harmony with the four elements. The crescent is more feminine and intuitive in nature. Together they can be seen as the balance of wisdom and intuition. Made of Silver.